1.Esteller, M., Non-coding RNAs in human disease. Nat Rev Genet, 2011. 12(12): p. 861-74. 2. Kiss, T., et al., Biogenesis and intranuclear trafficking of human box C/D and H/ACA RNPs. Cold Spring Harb Symp Quant Biol, 2006. 71: p. 407-17. 3. Panse, V.G. and A.W. Johnson, Maturation of eukaryotic ribosomes: acquisition of functionality.Trends Biochem Sci, 2010. 35(5): p. 260-6. 4. Williams, G.T. and F. Farzaneh, Are snoRNAss and snoRNAs host genes new players in cancer? Nat Rev Cancer, 2012. 12(2): p. 84-8.1826(1): p. 121-8. 5.Thorenoor, N. and O. Slaby (2015). "Small nucleolar RNAs functioning and potential roles in cancer." Tumour Biol. 36(1): 41-53. 6.Makarova, J. A., S. M. Ivanova, et al. (2013). 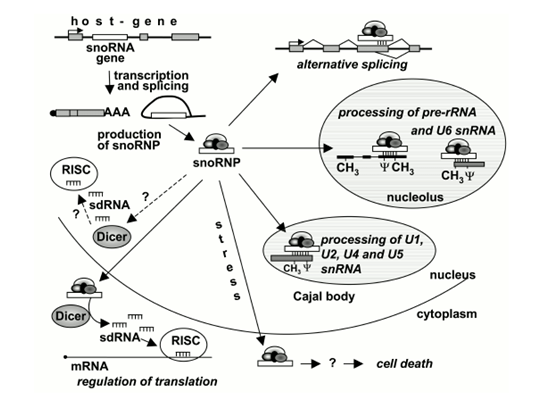 "New Functions of Small Nucleolar RNAs." Biochemistry 78(6): 638-650. 7. Thorenoor, N. and O. Slaby, Small nucleolar RNAs functioning and potential roles in cancer.Tumour Biol, 2015. 36(1): p. 41-53. 8. Huang, C., J. Shi, et al. (2017). 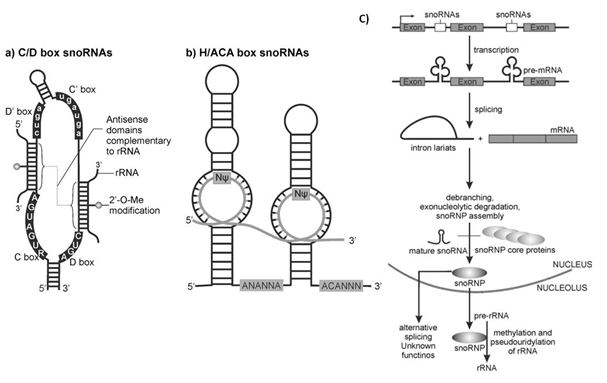 "A snoRNA modulates mRNA 3′ end processing and regulates the expression of a subset of mRNAs." Nucleic Acids Research 45(15): 8647-8660. 9. 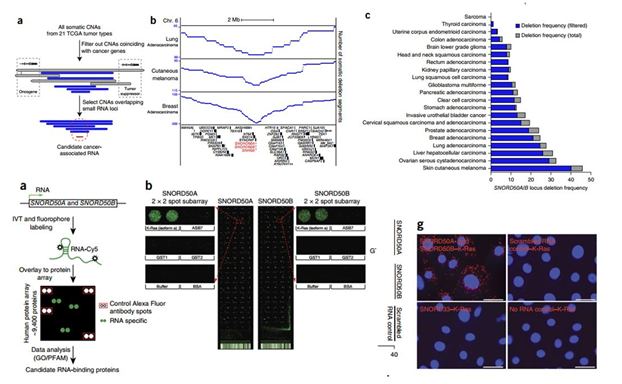 Liu, Z.H., et al., Small ncRNA expression and regulation under hypoxia in neural progenitor cells.Cell Mol Neurobiol, 2011. 31(1): p. 1-5. 10. Ender, C., et al., A human snoRNAs with microRNA-like functions. Mol Cell, 2008. 32(4): p. 519-28. 11. Brameier, M., et al., Human C/D box snoRNAss with miRNA like functions: expanding the range of regulatory RNAs. Nucleic Acids Res, 2011. 39(2): p. 675-86.Cell Mol Neurobiol, 2011. 31(1): p. 1-5. 12. Michel, C.I., et al., Small nucleolar RNAs U32a, U33, and U35a are critical mediators of metabolic stress. Cell Metab, 2011. 14(1): p. 33-44. 13. Chow, R. and S. Chen (2018). "Sno-derived RNAs are prevalent molecular markers of cancer immunity." Oncogene. 14. Xing, Y.-H., Yao, R.-W., Zhang, Y., Guo, C.-J., Jiang, S., Xu, G., … Chen, L.-L. (2017). SLERT Regulates DDX21 Rings Associated with Pol I Transcription. Cell, 169(4), 664–678.e16. 15.Liao, J., et al., Small nucleolar RNA signatures as biomarkers for non-small-cell lung cancer. Mol Cancer, 2010. 9: p. 198. 16. 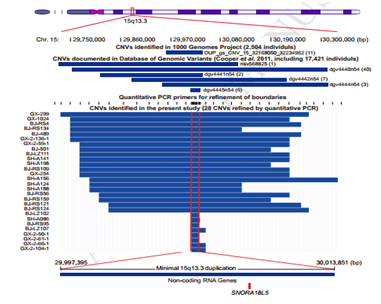 Dong, X.Y., et al., Implication of snoRNAs U50 in human breast cancer. J Genet Genomics, 2009.36(8): p. 447-54. 17. Dong, X.Y., et al., SnoRNAs U50 is a candidate tumor-suppressor gene at 6q14.3 with a mutation associated with clinically significant prostate cancer. Hum Mol Genet, 2008. 17(7): p. 1031-42. 19. Su, H., T. Xu, et al. (2014). "Elevated snoRNA biogenesis is essential in breast cancer." Oncogene 33(11): 1348-1358. 20. Siprashvili, Z., D. E. Webster, et al. (2016). "The noncoding RNAs SNORD50A and SNORD50B bind K-Ras and are recurrently deleted in human cancer." Nature Genetics 48(1): 53-58. 21.Zhou, F., Y. Liu, et al. (2017). "AML1-ETO requires enhanced C/D box snoRNA/RNP formation to induce self-renewal and leukaemia." Nat. Cell Biol. 19(7): 844-855. 22. Mannoor, K., J. Liao, and F. Jiang, Small nucleolar RNAs in cancer. Biochim Biophys Acta, 2012. 23. Mei, Y.P., et al., Small nucleolar RNA 42 acts as an oncogene in lung tumorigenesis. Oncogene,2012. 31(22): p. 2794-804. 24. Gee, H.E., et al., The small-nucleolar RNAs commonly used for microRNA normalisation correlate with tumour pathology and prognosis. Br J Cancer, 2011. 104(7): p. 1168-77. 25. 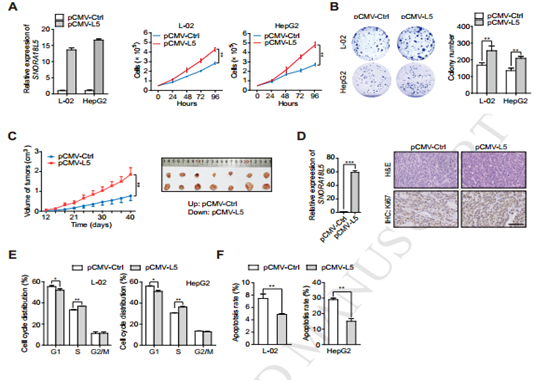 Xu, G., et al., Small nucleolar RNA 113-1 suppresses tumorigenesis in hepatocellular carcinoma.Mol Cancer, 2014. 13: p. 216. 26. Cao, P., Yang, A., Wang, R., Xia, X., Zhai, Y., & Li, Y., et al. (2018). 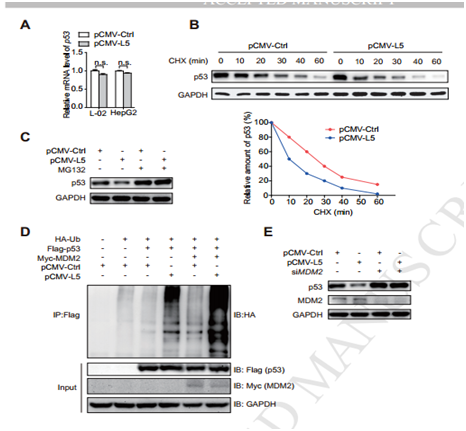 Germline duplication of snora18l5, increases risk for hbv-related hepatocellular carcinoma by altering localization of ribosomal proteins and decreasing levels of p53. Gastroenterology, 155(2). 27. Nakatani, J., et al., Abnormal behavior in a chromosome-engineered mouse model for human 15q11-13 duplication seen in autism. Cell, 2009. 137(7): p. 1235-46. 28. Cullen, B.R., MicroRNAs as mediators of viral evasion of the immune system. Nat Immunol, 2013.14(3): p. 205-10. 30. Zhang, B., Han, D., Korostelev, Y., Yan, Z., Shao, N., & Khrameeva, E., et al. (2016). Changes in snorna and snrna abundance in the human, chimpanzee, macaque and mouse brain. Genome Biology & Evolution,8(3), 840-850.